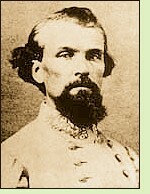 Devil's Dream is about Nathan Bedford Forrest, the Tennessean whose sheer fighting genius raised him from private to general in the Confederate Army. A slave trader and real estate speculator before the war, he was in most ways the opposite of the gentlemanly Robert E. Lee. Born into poverty, he had no formal military training and no battlefield experience before the war – though he had killed two men who murdered his uncle. Fiercely intelligent, quick-tempered, plain-spoken to the point of rudeness, generous, courageous and marked by a wide streak of stubborn integrity, Forrest is as much a novelist's dream as a devil's, a larger-than-life personality no less admirable than he is deplorable. Devil's Dream seems to conjure the presence of the man himself, partly through the medium of a patchily clairvoyant black wanderer of uncertain heritage whose path crosses that of Forrest's recruiting party in the summer of 1861. (Black men did serve in Confederate regiments. Forrest offered to free at war's end any of his slaves who would serve under his command as teamsters. Forty-five did.) Pressed for his own story and told "Ain't but one right way to tell a story," Henri responds, "I'll tell it backward then." Devil's Dream is on my "Best Historical Novels I Read in 2009" list. Bedford Forrest and His Critter Company by Andrew Nelson Lytle (1931; reprinted 2002). A Battle from the Start: The Life of Nathan Bedford Forrest by Brian Steel Wills (1992).